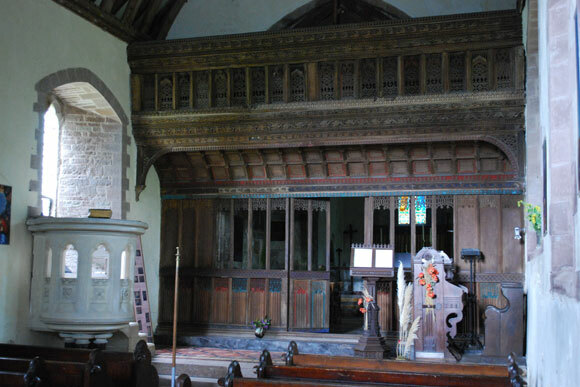 b) the late 15th century screen, one of the finest in Southern Wales and delicately repaired in the 19th century. It fills the entrance to the sanctuary and, as Richard Wheeler puts it, in his book on “The Medieval Church Screens of the Southern Marches” it is “superabundantly encrusted with carved decoration”. The traces of colour ( green, red and blue ) are 19th century but based on medieval precedent. A painted figure of Christ, on the chancel arch above, was visible in 1877 but has now gone – the carved crucifix, or rood, which would have surmounted the centre of the screen was no doubt a victim of the Reformation. c) the two main products of the 19th century restoration carried out by Rev William Price between 1863 and 1878 and supervised by J.P.Seddon. These are the floor tiles of c.1866-8, made by Godwin ( figures ) and Maw and Co (patterns) which were in part inspired by the Revelation of St John the Divine and the East Window of c.1877 showing The Annunciation, also by Seddon but from a cartoon by H.A.Kennedy. John Newman in the Pevsner for the county refers to “the nervous intensity of the figures, their Pre-Raphaelite style and the unusual colouring in turquoise and brown” which “make this an exceptional creation”. On your visit also look out for the carved head of “The Green Man”, what appears to be an early medieval stone lamp and the rose and the pomegranate in the nave window lighting the screen which is an allusion to the marriage of Prince Arthur to Catherine of Aragon in 1501. Between 1655 and 1659 the rector was the Puritan Divine, Rev William Cradock, who preached the celebratory sermon in Parliament on the fall of Charles 1’s headquarters in Oxford in 1646. We carried out a first programme of repairs in 2013-2014, but know that we have to do more to the interior. There is signage on the approach road.